Each piece of this outfit shows the same level of quality and attention to detail. 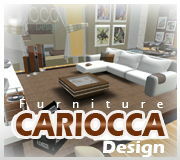 Textures are very well done, showing a “realistic” look without being simply “photorealistic” in the most boring way. What I mean is, even though the designers could have simply used photosources, they weren’t satisfied with their work without adding a lot of their own creativity and vision to it. The result is a look that isn’t cartoonish at all, but doesn’t give you the impression you just have RL photographs applied to your avatar. In the end, a very cool look, full of SL spirit, with creativity and craftmanship in every component, thanks to Lissa Maertens, Posy Trudeau and Jesseaitui Petion! 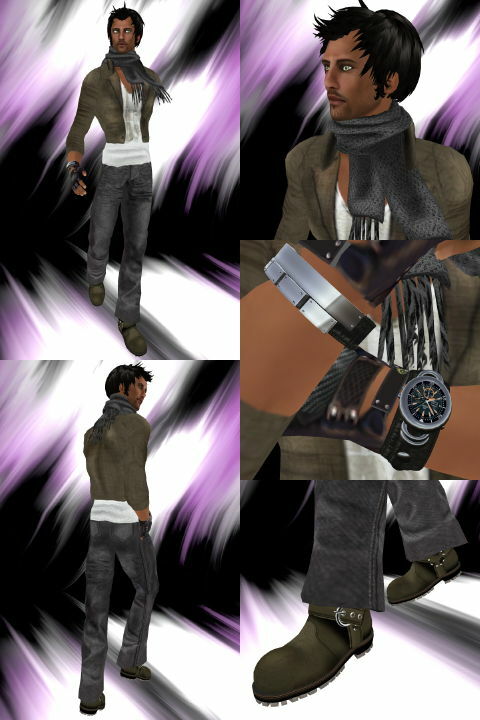 I added nice gloves by Armin Wiefel for “Drawmachine,” with prim attachments for a better look, a modern and casual Watch and Bracelet by HugoZion Kondor for “JHZ,” a very cool haircut by Bo Nakamura for “Boon” and “Neo” by Kaoz Koba for “Damiani,” in tan with beard for today. Nouveau chez / New at: Gearshift, Ottico & Random. Donovan Brennen, the designer behind Gearshift, was on a creative hiatus. I know many people missed him. He came back a few weeks ago on the SL fashion scene with a couple of hoodies and matching tee shirts which are definitely must-have. “Guile Man” (shown in the main composite) and “Icon Red Male” (look at it on the secondary composite) offer very original textures in cool colors. “Guile” shows a very nice and original pixelated camo pattern in khaki and olive for the jacket, worn over a tee shirt full of bombs! “Icon Red” jacket is softer, with its jacket with subdued red pattern and fur collar worn over a modern-lover themed tee-shirt. 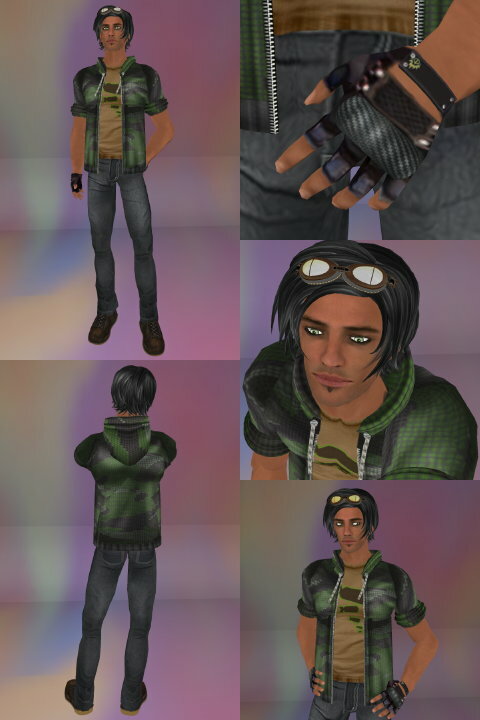 In each pack, you will get different layers allowing you to wear the hoodie alone, or with a tee-shirt underneath, or the tee-shirt alone (combinations of shirt and jacket layer); two prim sculpty cuffs to wear with the sleeves rolled up (using the sleeve length slider of the jacket on appearance mode); a hood, worn down, in three sizes; the same hood in a worn up version, in three sizes as well; 2 pre-sized prim lower parts. Note that you can buy for a small price a special hair complement especially designed by the talented Aemilia Case, coming in four colors, to wear with the hood up. This is a really good idea, as most of the time you are forced to go bald under hoodies, due to the hair showing up through them. I like the amount of options offered. The prim attachments are nicely done and not too tricky to adjust, but I have to say I’m not a fan of the the prim lower part for jackets idea. Donovan’s work is not the problem; I have the same question on each and every piece of clothing on the market with a prim lower jacket. You can adjust them the best you can, and it looks good on a certain pose, with an amazing 3D feeling you can’t get even with the best texture ever; but how can you deal with them when you walk, sit, or let your AO change your poses? You will see that prim attachment passing through your body, again and again… Okay, first, it’s not painful at all; and second, I know many people who really don’t care. But I’m definitely not convinced, although I agree it’s a great enhancement on a purely aesthetic point, on static poses, after proper adjustment . Maybe one day we will have some script making this kind of attachment follow your body movement (like the one for women’s skirts, kinda)? Until then, I consider SL limitations too much of an issue to really allow this kind of enhancement on clothing. That said, I’m very thankful to those at Gearshift, Muism and Cubic Effect, to name a few, for trying to push the limits to the max! 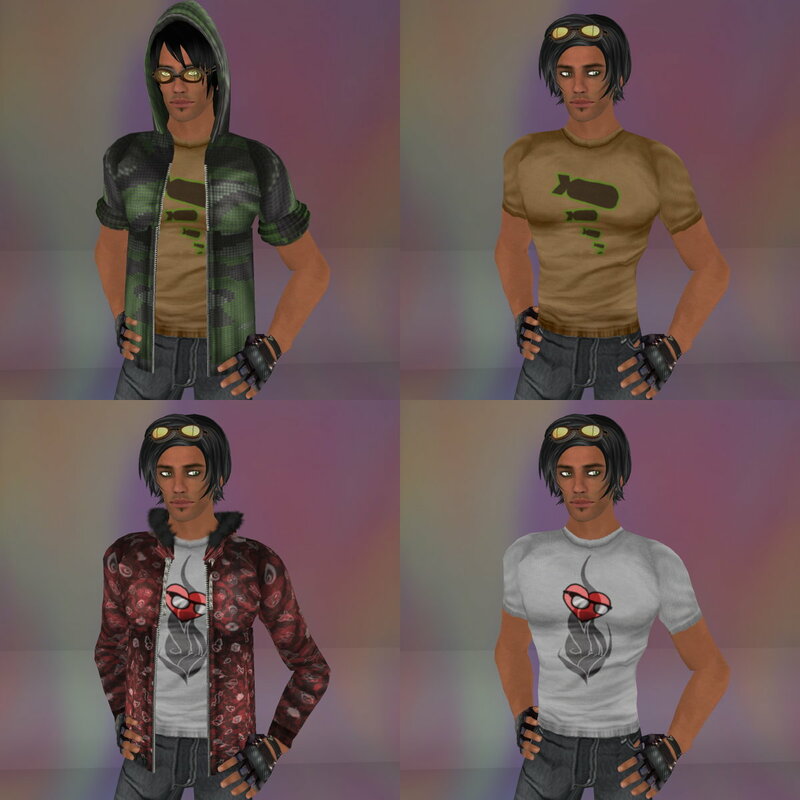 Each of the new hoodie/shirt packs from Gearshift is sold for 400 Lindens. Everything is moddable and copy-no transfer. You can get special hair complements for 75 Lindens each. [GearShift] GUILE MALE: Jacket and shirt, Bombs Away shirt alone, [GearShift] iCON Red MALE: jacket and shirt, Geek Heart shirt alone. I wouldn’t forget the special anniversary googles from Ottico! They come in three versions: on nose, on head (both shown) and hanging around the neck. They are fully scriptable for color changing, moddable and copy-no transfer. I love their buckles and leather texture. Thank you Youki Rau, and keep up the good work! Detailed credits after the jump!